The Lunt Engineering 152mm ED APO doublet was designed by APM Telescopes and is a mold-breaker in the 6” Refractor category. It has been painstakingly engineered to provide you the optical and mechanical quality you would expect from APM, but at a surprisingly affordable price. The 152mm ED APO telescope features a doublet lens cell that uses specialized ED glass equivalent to FPL-51. A Lanthanum-coated element is included to maximize performance. As with all APM telescopes a high level of consistency is assured. For those who would like written proof regarding the quality of their optics, an optional interferometry test at the 532nm (green) wavelength can be performed on your new telescope before it ships from the factory for an additional fee. With a generous 1200mm of focal length, the Lunt Engineering 152mm ED APO is an impressive all-around telescope. 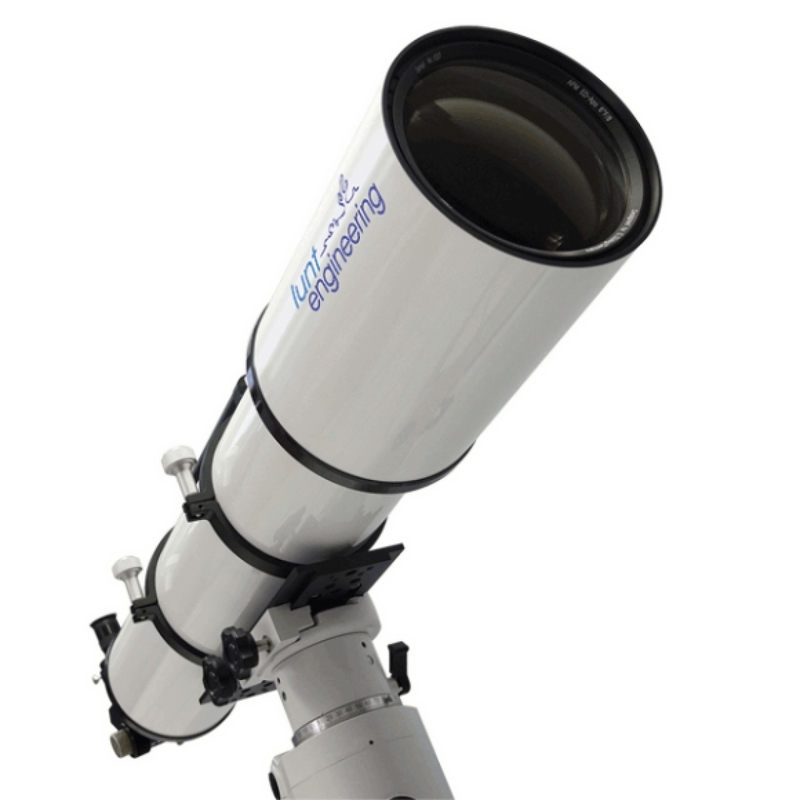 From intricate double star observations to high contrast detailed planetary views, this scope will introduce a whole new group of Astronomy enthusiasts to just what a high-quality refractor can do. The Lunt Engineering 152mm ED APO telescope is supplied with all of the accessories you will need to start observing, right out of the box. Inside the quality aluminum transport case you will find a newly designed 2.5” focuser, CNC tube rings incorporating a carrying handle, a Losmandy-style dovetail, a 2” Star Diagonal and a finder bracket. All ?you need to do is add an eyepiece, a finder scope and a heavy-duty mount. The 2.5” focuser is a Rack and Pinion type, with 1:10 fine focusing. It remains rigid under high loads, making this heavy-duty focuser very suitable for imaging. The 2” and 1.25” eyepiece adapters use a newly designed collar clamp, which will provide considerable improvement over brass compression type adapters. Although the standard focuser is great for imaging, we do offer a Starlight Instruments Feather Touch (model FTF3035B-A) as an optional upgrade. Already have a Starlight Instruments FT focuser? The tube end has the required M109 x 1 and M95 x 1 threads to accept a 3” or 2.5” Starlight focuser of your own as well. Other optional imaging accessories for the 152mm ED APO include a 2.5” field flattener, which maintains the focal length of the telescope, as well as a dedicated Massimo Riccardi designed Reducer. The reducer changes the focal length by a factor of x0.75, yielding a 900mm focal length and fast f/5.9 focal ratio.